This match is for Mutoh's IWGP Heavyweight Championship. They circle each other to start the match and start the feeling out process. They jockey for position on the mat with Mutoh getting the advantage, but Tanahashi quickly gets out of it and they return to their feet. Back on the mat, Tanahashi gets a side headlock applied and goes for the cross armbreaker, but Mutoh quickly gets out of it and applies a cross kneelock. Tanahashi gets out of it and goes back to the side headlock, Mutoh Irish whips out of it and the two collide with both going to the mat. Snapmare by Tanahashi and he applies a headscissors until Mutoh makes it to the ropes. Mutoh rolls out of the ring to re-gain himself, but he returns after a moment. Tanahashi grabs Mutoh's leg and delivers a dragon screw leg whip, and he then repeatedly kicks Mutoh in the knee. Mutoh tries to get away but Tanahashi grabs him and elbows him in the leg. Tanahashi applies a leg lock but Mutoh makes it to the ropes and forces a break. More kicks to the leg by Tanahashi and he yanks back on Mutoh's leg, pulling it in the wrong direction. Tanahashi applies the bow and arrow submission hold but Mutoh rolls into the ropes and Tanahashi releases the hold. Tanahashi picks up Mutoh and throws him into the corner before kicking him in the knee again. Back up, uppercuts by Tanahashi in the corner but Mutoh kicks him back and elbows him in the head. Snapmare by Mutoh and he nails the Flash Elbow. Both wrestlers slowly get up and Tanahashi kicks Mutoh in the leg. Tanahashi picks up Mutoh and puts his leg onto the ropes in the corner before dropkicking it. Tanahashi grabs Mutoh's leg and pulls him down so he can ram it into the ring post and ring apron. Tanahashi slides back in the ring, he picks up Mutoh and goes for a dragon screw leg whip, but Mutoh knees him in the head and delivers one of his own. Tanahashi rolls to the apron but Mutoh goes down to the floor and hits a dragon screw leg whip from the apron to the floor. Mutoh then dropkicks Tanahashi while he is still lying on the floor, he then picks up Tanahashi and gives him another dragon screw leg whip. With Tanahashi lying against the railing, Mutoh runs up and delivers a Shining Wizard. Mutoh then goes to the other side of the railing, grabs Tanahashi's leg so he is straddling the rail before hitting a dragon screw. Mutoh rolls back into the ring while Tanahashi is still on the other side of the railing, and he slowly starts crawling back to the ring. He finally makes it back in at 14, but Mutoh promptly dropkicks him in the knee. Tanahashi slides out to the apron, but Mutoh dropkicks him in the knee again. Tanahashi stands up, but Mutoh grabs his leg and delivers a dragon screw leg whip with his leg on the second rope, pulling Tanahashi back into the ring. Dragon screw leg whip by Mutoh and he slaps on the figure four leg lock. After a minute or so Tanahashi makes it to the ropes, so Mutoh breaks the hold and dropkicks Tanahashi in the knee. He goes for another dragon screw but Tanahashi slaps him and the two trade blows. Mutoh dropkicks Tanahashi in the knee but Tanahashi fires right back with his own dropkick to the knee. They trade dropkicks again, Tanahashi goes for a kick but Mutoh catches his leg and hits a dragon screw leg whip. Dropkick to the knee by Mutoh while Tanahashi is lying on the mat, he waits for Tanahashi to get up and hits a dragon screw leg whip before applying the figure four leg lock again. Again Tanahashi makes it to the ropes and Mutoh has to break the hold, Mutoh goes up to the second turnbuckle and dropkicks Tanahashi in the leg. Mutoh grabs Tanahashi's leg but Tanahashi slaps him away. Waistlock by Tanahashi, Mutoh blocks the suplex so Tanahashi delivers a chop block. Tanahashi picks up Mutoh and delivers a series of elbows and kicks, scoop slam in front of the corner and he hits a rolling senton off the second turnbuckle. Cover, but Mutoh has a foot on the second rope. Tanahashi picks up Mutoh and hits an uppercut, Irish whip by Tanahashi to the corner, reversed, and Mutoh knocks Tanahashi out with a Shining Wizard. Mutoh grabs Tanahashi's leg and hits a dragon screw leg whip, he goes for his trio of Shining Wizards (front, back, and finishing one to the front) but Tanahashi blocks the third one and elbows Mutoh in the knee. Texas Cloverleaf attempt by Tanahashi, but Mutoh blocks it. Elbow drops by Tanahashi and he dropkicks Mutoh in the leg. Tanahashi goes off the ropes and hits the Sling Blade, cover, but Mutoh gets a shoulder up. Tanahashi goes for the dragon suplex, Mutoh blocks it, but Tanahashi connects with the trapped German suplex for a two count. Tanahashi goes up to the top turnbuckle and hits the High Fly Flow, but he hit his knee on the landing and can't cover. Match Thoughts: Epic. This match was everything that it should have been. Mutoh has used the same basic formula to win hundreds of matches, and it looks like it will work here as well as he completely destroys Tanahashi's knee in more ways then one could imagine. Tanahashi though doesn't stay down, and Mutoh makes the mistake that has cost him big matches in the past... going for the moonsault at the wrong time as a desperation move. Tanahashi quickly capitalized on Mutoh's mistake, and the ending stretch of the match was almost perfect as Tanahashi defeated his former mentor for the first time. 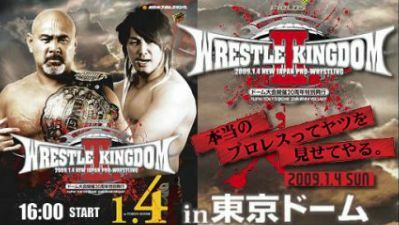 They had a few mishaps, which always happens in a match that is over 30 minutes long, but for the vast majority of the time they were very focused on what they were doing and both knew how important this match was not only for the promotion but for Tanahashi.